Oh my goodness gracious. I'd like to dive head first into that bowl of caramel-y goodness. I NEED to put this on my To Bake list. I'm seeing cupcakes with a surprise inside... or a decadent layer cake... or... ah, the possibilities. I am saving this! How wonderful to put between a cake or cookie sandwich! YUM! Oh, yum, I'm with Kelly. Initially I thought I'd love to stick my spoon in and take a taste but forget that diving in sounds about right! LOL! What a bowl of yumminess! I'm certainly going to file this one away. I can think of several excellent uses for your beautiful creation. Caramel pastry cream sounds so good! Delicious looking and delicious tasting and quite simple to make! I've never made this before. This was pure delight and I'm sure to make them again. That looks fabulous! I'm making caramel eclairs with this recipe! Tried this recipe and couldn't get my creme near that dark, did you add dye (the french chefs I worked with sometimes did)? Or maybe browned the butter? Or maybe your caramel was just really dark? Or possibly something got lost when I converted ounces to grams....(highest posibility) anyways, it was delicious! I didn't use any coloring, I just cooked my caramel until it was quite dark. Great recipe, made it, came out perfect, used it to fill macarons. Also lightened it up with whipped cream for a cake filling. Thanks! This recipe turned to candy the Both times I tried, and I followed your directions, exactly. Very disappointing. Did the caramel solidify when the milk was added? If so, you’re probably cooling the pan of caramel in the ice water bath too much. Just touch the bottom of the pan to the surface of the ice bath for no longer than a moment. You can also try using warm milk. 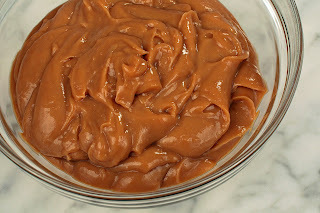 I hope this helps, but if the caramel seizes up again the solution is to simply stir the milk and caramel together over medium-low heat for a few minutes until the caramel melts. how many ml is in 1 cup? A cup is approximately 237 milliliters. I tried this and the sugar went n from white, to Amber... I immediately took it off, but smelled burnt... I'm not sure what went wrong. Any tips? The sugar is ready when it is a deep amber color, or a candy thermometer registers about 335˚F. Keep in mind that caramel can go from perfect to burned in a matter of seconds. So when it is done, you must be ready to stop the cooking immediately. Dip the bottom of the saucepan into an ice water bath for a moment to avoid carry-over cooking. I hope this helps. For more tips on cooking caramel, please see my first cookbook.